No matter where we look, many of the street lamps and fences are plastered with “missing” posters. 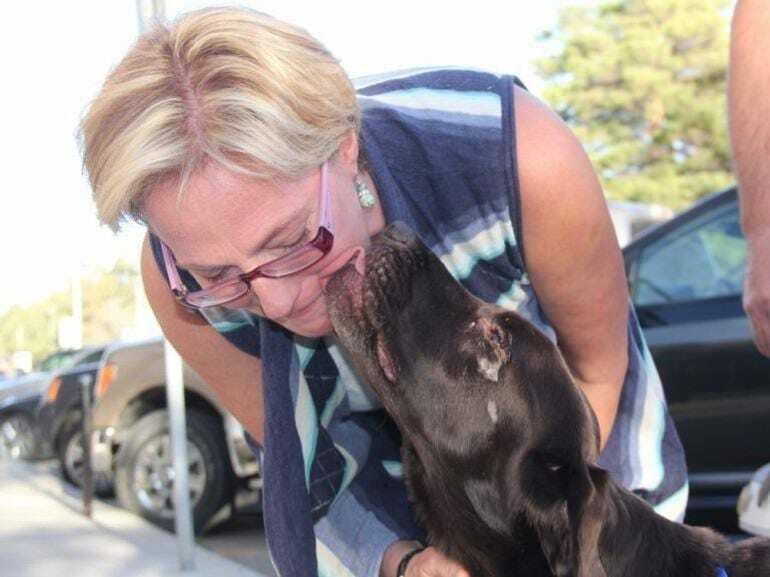 Some come with rewards while others have pleas that their pet is returned home safely. No matter what animal it is that has wandered out of your life, losing a pet can be a hugely traumatic event for anyone. After all, how would you feel is one of our family members just disappeared without a trace? Thankfully, there are several ways we can help our pets to find their way back home. Having small animals microchipped, getting identification tags for their collars, and making sure your yard is nice and secure are all ways you can prevent your pet from getting lost in the first place. Thankfully, it seems as though chances that an owner and their lost pet will be reunited are increasing. Reports show that 75% of cats and 93% of dogs are lucky enough to be reunited with their owners, even after they have run away from home. Many of these pets are taken to local shelters, but sometimes we are greeted by kind-hearted strangers that return our furry additions to their rightful owners. However, even after all that good news, this family were beginning to lose hope they would ever see their dog again. 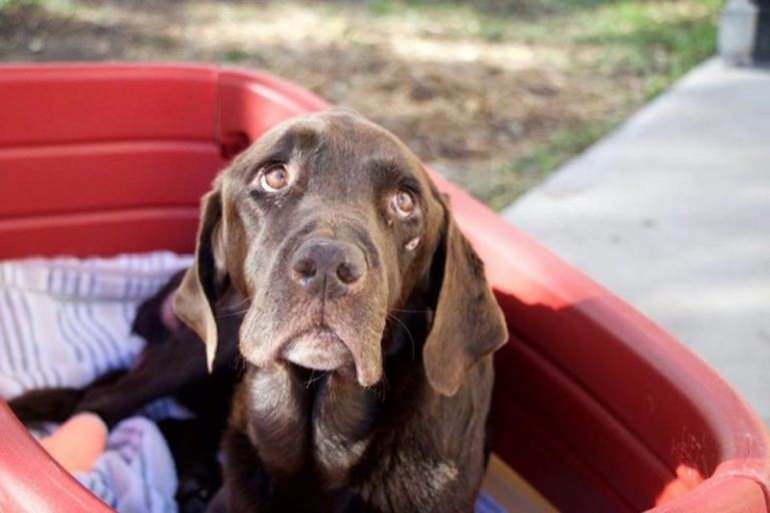 Their dog was missing for a month, and now their other pooch was starting to act strangely. Would they ever be able to recover from the loss in their family? 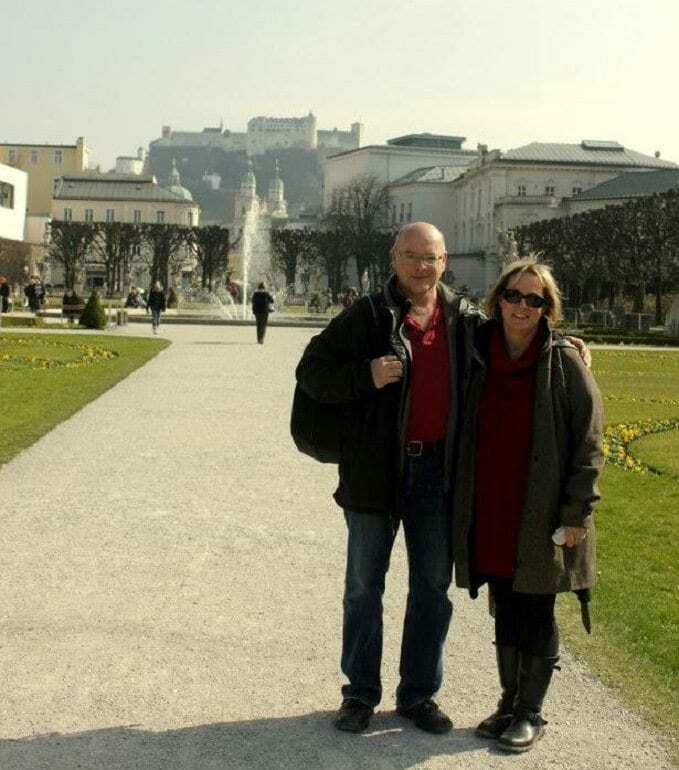 Cynthia and John Billesberger are an average couple living in Estevan, a city in Saskatchewan, Canada. The couple are used to the cold as temperatures can plummet as low as 1 Fahrenheit, or -17 Celsius in the winter. Thankfully, the fall offers kinder temperatures as Estevan regularly sits between 29 and 53 Fahrenheit (-2 to 12 Celsius) each day. However, the cold and snow have never put the Billesbergers off the idea of getting outdoors and enjoying nature. Plus, they have a reason to visit Mother Nature on her home turf. The couple aren’t alone, as they have a selection of four-legged friends that often join them on their adventures. 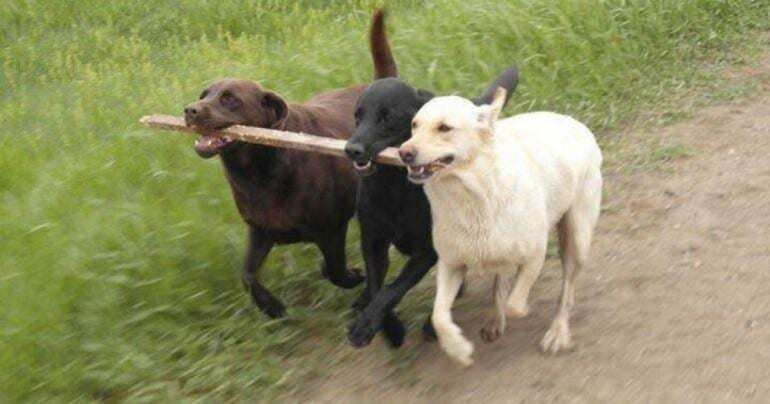 Labrador retrievers traditionally come in three colors, and all have their unique personalities. However, Cynthia and John couldn’t decide what color to choose, so what did they do? Adopt one of each, of course. Black labradors are the most common, and the couple named theirs’ Jasper. Yellow, or golden, labs are next on the list, and Cynthia and John decided to call theirs’ Esme. Finally, chocolate labs are the least common color, with Bruno completing this family of five. It wasn’t long before all three of the dogs became part of the family. In fact, the pooches loved to join Cynthia and John on all their adventures no matter the weather. They’re labradors, after all; it’s what they’re good at. Although the family loved nothing more than taking a walk together, they were about to head on an adventure of a lifetime. One that would have a life-changing outcome. Little did they know, but the Billesbergers were about to come home with one less friend. It was September 2016, and the weather in Estevan was starting to cool down after a long, hot summer. That’s when the Billesbergers made a mistake. Cynthia and John laced up their boots and headed out for a walk with their pooches. Everything seemed normal. That was until they tried to call their dogs to go home. As Esme and Jasper appeared in the distance, the couple noticed they were one dog missing. Bruno was nowhere to be seen. They began to panic. Cynthia and John began to look everywhere. Bruno had been right there the whole time; surely their dog couldn’t have gone far? However, as the sun started to set, the air temperature began to get colder. They needed to get their other dogs home and hope that Bruno would return on his own. When the couple woke up to find Bruno still wasn’t back, they went out to see if they could find him. Day after day they trawled through the local wilderness. Sadly, Cynthia and John were starting to give up hope that Bruno would ever come home. The days soon turned into weeks, and before anyone knew it, Bruno had been missing for an entire month. The worst part? 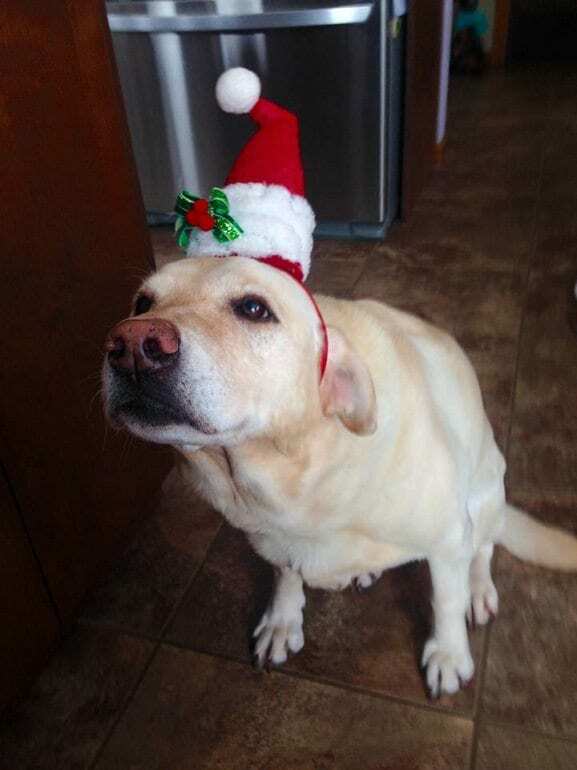 There was still no sign of what could have happened to their beloved lab. Cynthia and John began to hope that Bruno had been taken in by another family. It was the only way they could make themselves feel better. At least this way he would still be living in a loving family home, but it was no use. They just wanted answers. John knew that he had to keep a brave face for the other two pooches in the family. 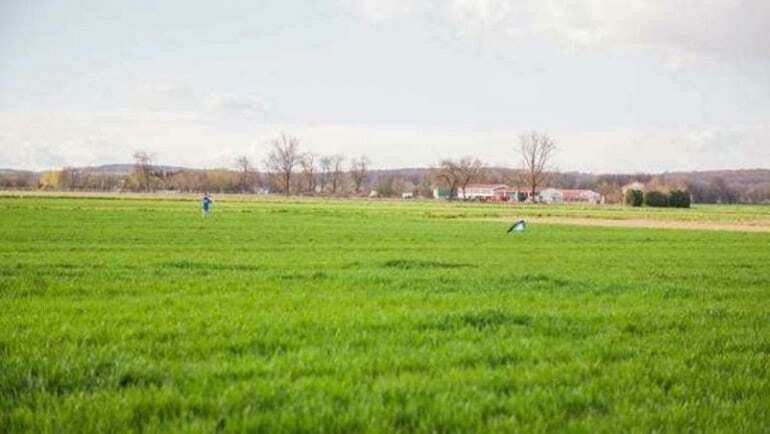 Rather than mope around the home, John decided he would get out his boots and head out for a walk. Who better to join him that Esme? 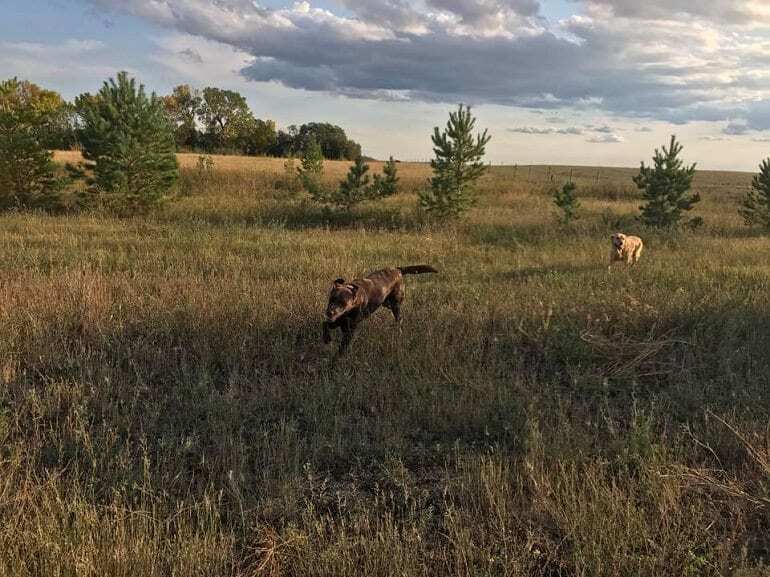 The pair ended up next to their neighbor’s house when Esme began to wag her tail and root around in a spot in the corner. It looked as though the labrador had found a scent or at least something that needed to be investigated by a curious nose. The Billesbergers were used to their dogs getting their noses into all kinds of trouble while out on walks, so John didn’t think anything of Esme rooting around in the bush. He carried on walking, but Esme was determined to stay behind and investigate. John called and called for his dog, and even tugged on her collar. However, nothing was enough to drag her away from the spot. It was starting to look as though Esme was trying to get John’s attention. John was starting to get curious. What could be so fascinating that Esme had planted to the spot? He got on his knees and began to dig around in the bush. That’s when he found it – Esme had found a hole! Only, it wasn’t just any hole. 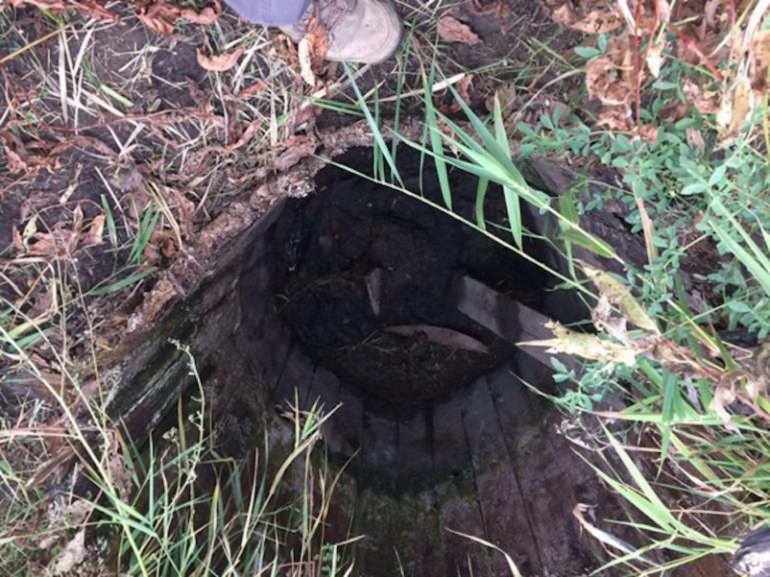 No, it seemed as though this four-foot wide, ten-foot deep hole was once a well. Now it had been lost to time. John didn’t think anything more of the well until Esme appeared by his side trying to get a closer look. That’s when John saw what had caught her interest. After peering into the hole, John could see something at the bottom. It was Bruno! John had no idea how long he had been trapped at the bottom of the well, but it looked as though there was a chance his precious pooch was still alive. Bruno couldn’t make a sound, and John could see his eyes were sunken back into his head. 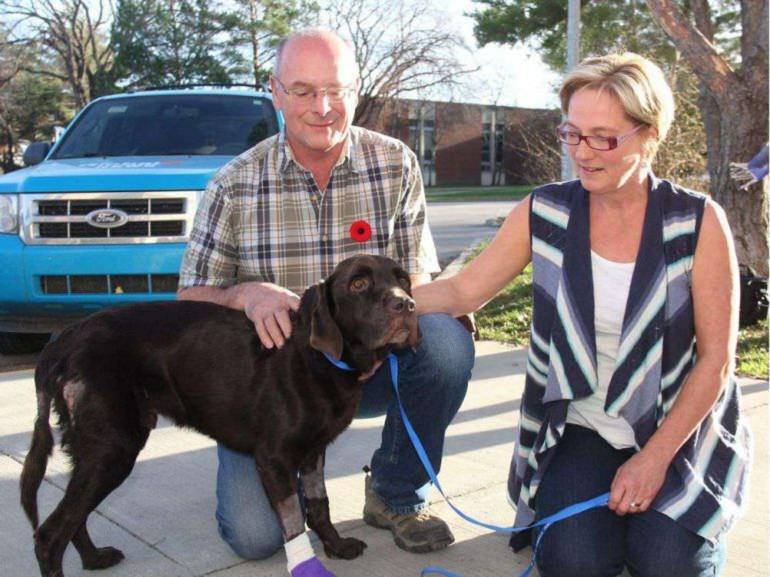 Bruno needed to be brought to safety – and fast. Who knew how much longer he could hold on? John had no idea what to do. After all, it was a 10-foot deep hole, how was he meant to get Bruno out alone? He needed reinforcements, so called up his son, Bernie Billesberger. It wasn’t long before Bernie was on the scene, and he came armed with rope. Bernie carefully tied it around his waist and lowered himself into the hole. He didn’t care about his life; he just wanted Bruno brought to safety. Bernie used his most soothing voice to talk to Bruno as he carefully lifted him up to the top. Now Bruno was out of the well the pair could assess all his injuries. 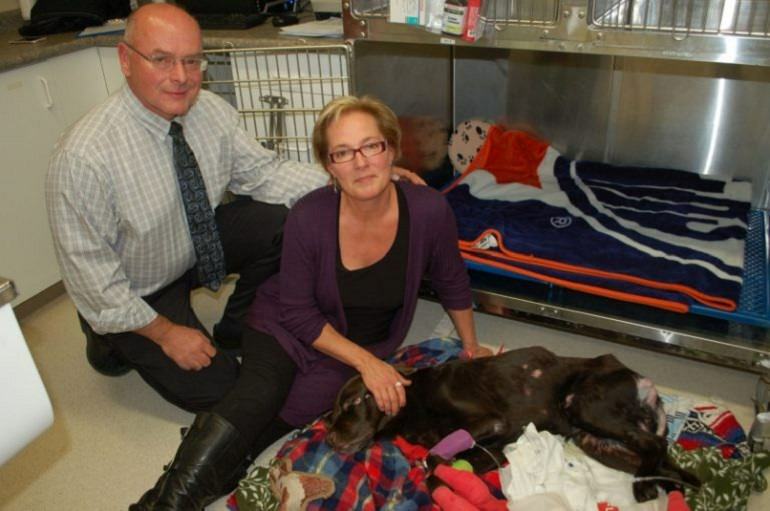 The poor pooch was covered in sores and cuts from head to paw. That wasn’t all. Many of these had got injected, while Bruno’s coat had gone crusty from the damp conditions he had been living in all this time. As of that wasn’t bad enough, Bruno’s paws had worn off after spending so long trying to climb his way to safety. Bruno was now a shell of the dog they had once known and loved. Bernie and John loaded Bruno into the car and got him to the vets as quickly as they could. The team had an emergency team on standby who were ready and waiting to rush Bruno into the ER. 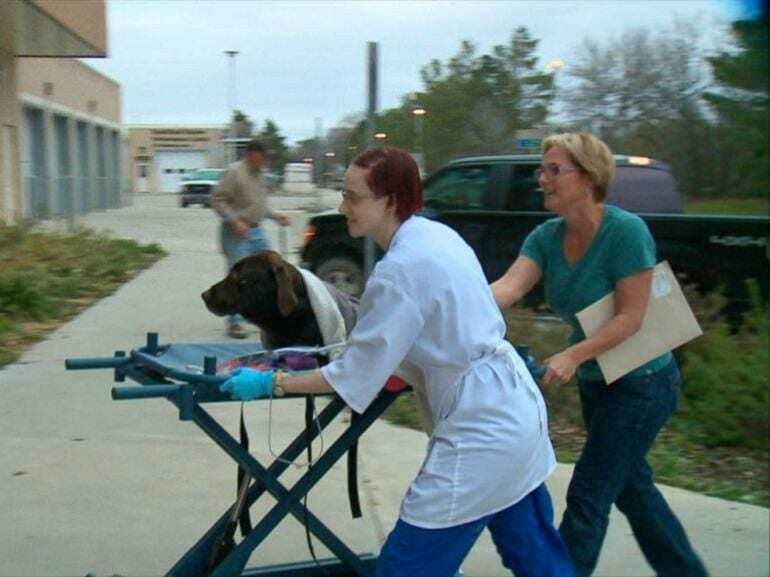 Here, he was hooked on IV fluids while they began to treat his injuries. Unfortunately, they all knew Bruno didn’t have a good chance of making it through the night. 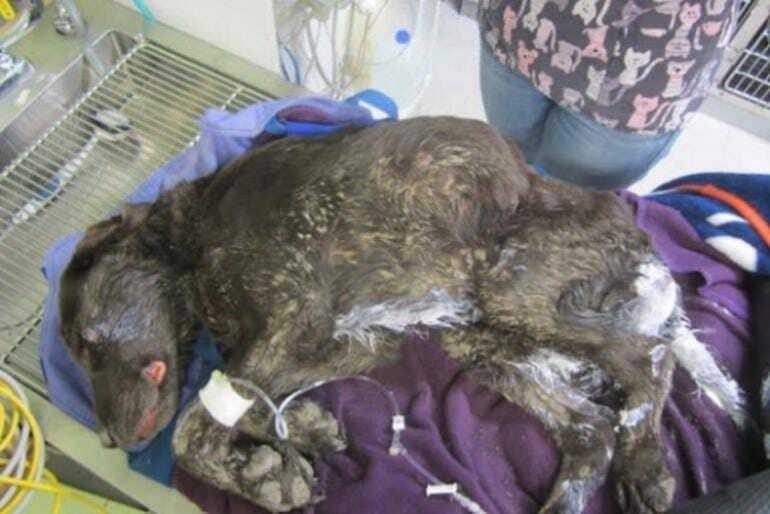 As well as being anemic, Bruno was also malnourished and dehydrated. He would need round-the-clock care if he stood a chance. 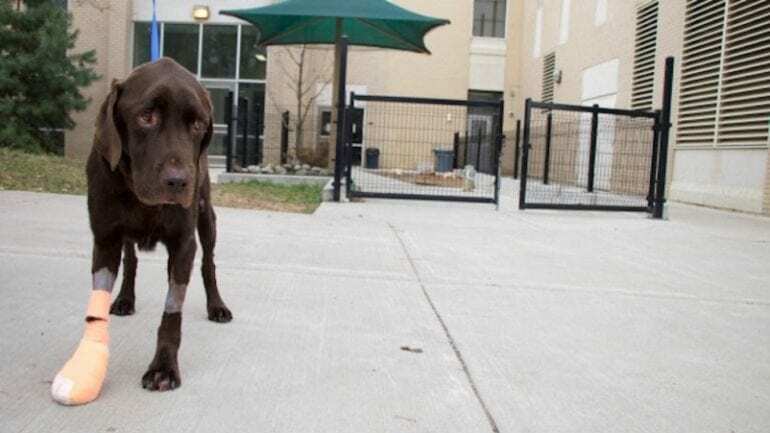 After the vets treated his initial injuries, they were able to take a closer look at Bruno. The team guessed he had been stuck in the well the entire 27 days he had been missing judging by the injuries he had sustained. 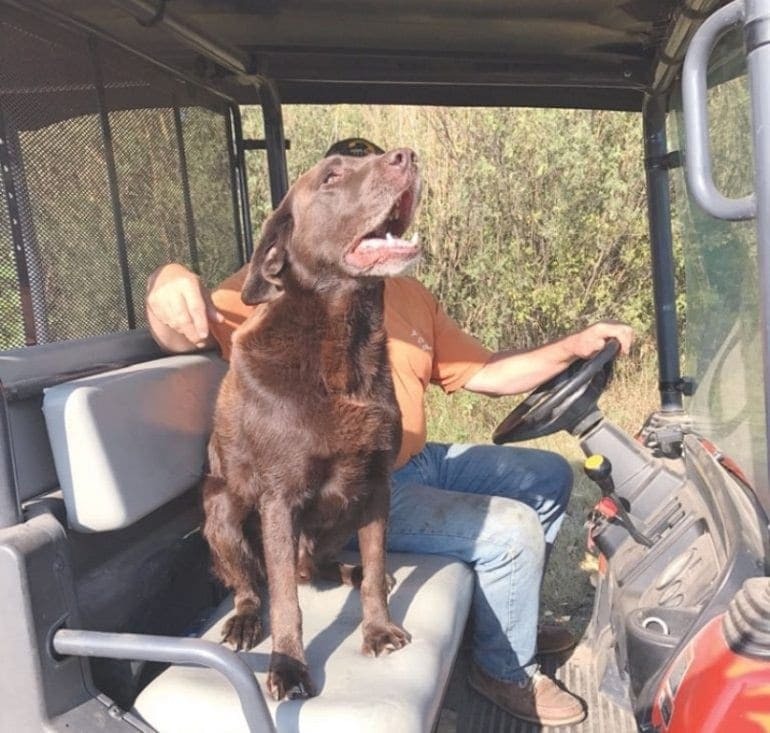 However, it seemed as though falling in a well was a blessing in disguise for this labrador. The little snowfall Canada had received gave Bruno enough water to drink to keep him alive. Without the snow, chances are Bruno would never have survived. 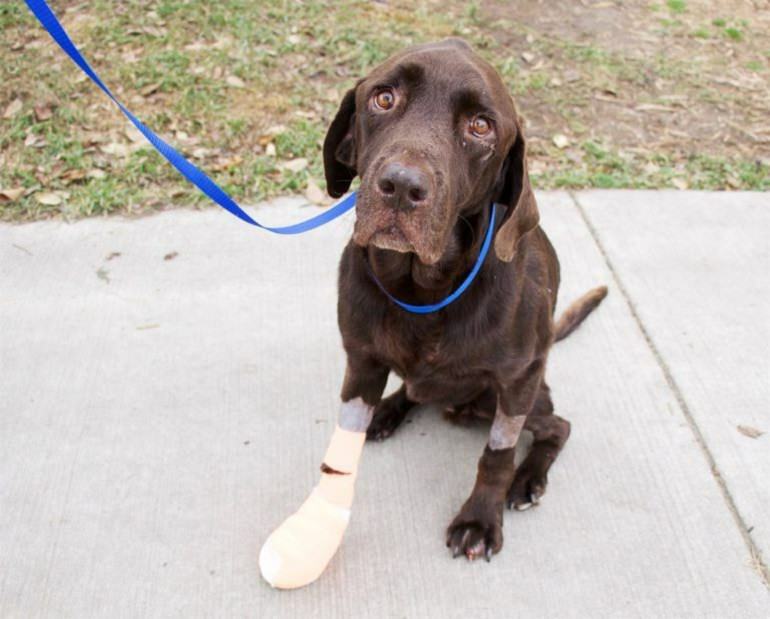 The vet team were forced to bandage up Bruno’s paws if they stood a chance of recovering. It seemed as though he had spent days trying to climb the walls of the well to escape and now there was nothing left. One paw was so bad it needed to be put into a cast. 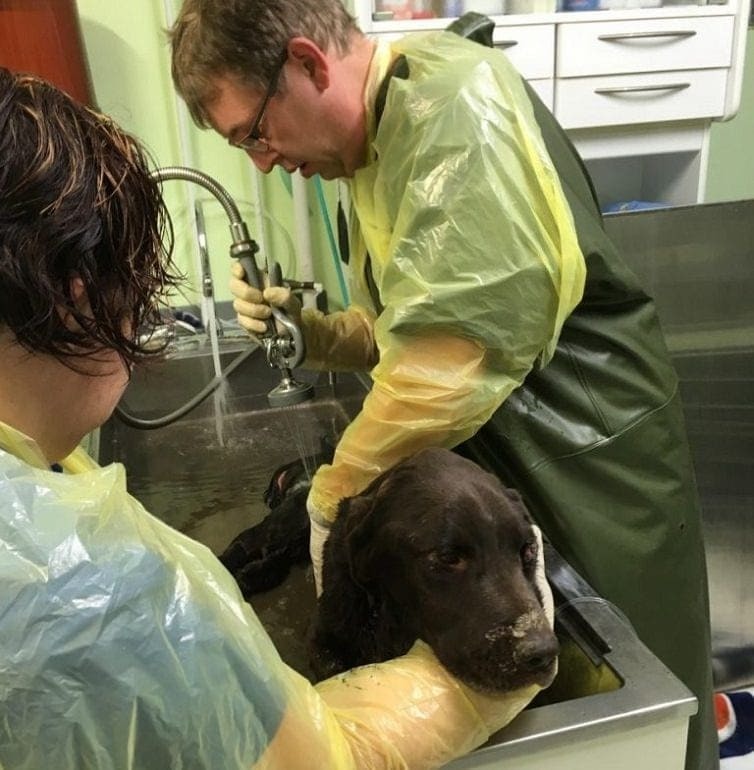 Even with all this treatment, Bruno still wasn’t making a significant recovery. There was only one type of medicine he needed. Thankfully, they had just arrived at the clinic. As soon as Cynthia and John walked into the room, Bruno recognized his beloved family. They were reunited at last! Bruno began to wag his tail in excitement and immediately looked more alert than before. The labrador had a reason to keep going all this time; now, they were standing right in front of him. Without John, Bruno never would have made it out of the well. John knew the sad truth, and now he wanted to be there every step of the way for the recovery. Cynthia and John were about to get the news they had been hoping for. After 22 days in the vet’s clinic, Bruno was finally healthy enough to return home! The couple were delighted to be reunited with their four-legged friend. Cynthia admits she thought Bruno was a goner, but he managed to prove everyone wrong with his fighting spirit. Sadly, Bruno was still battling refeeding syndrome, an illness that affects dogs that have been starved for long periods of time. 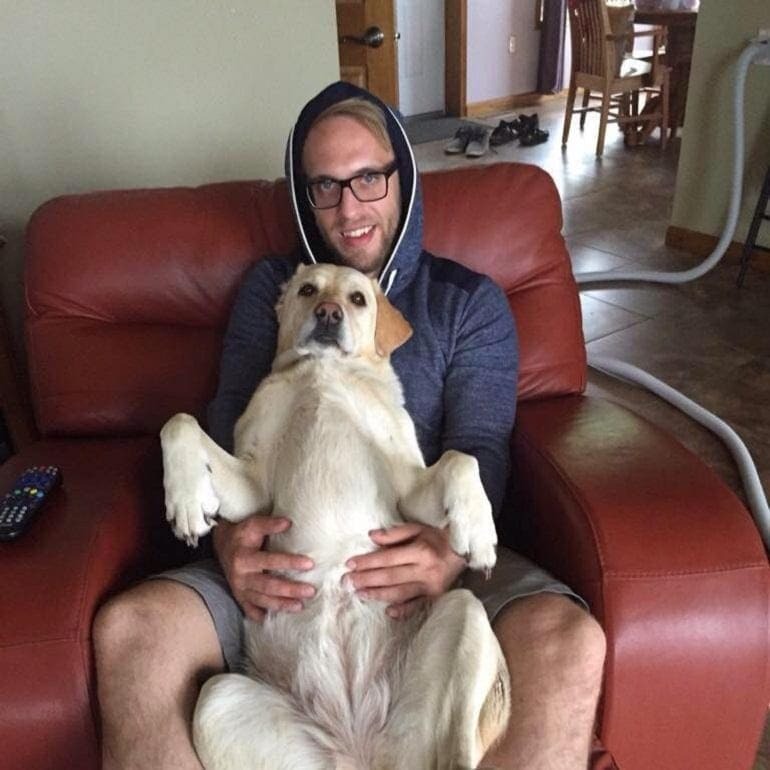 At least now Bruno would be surrounded by the love he needed to recover. It wasn’t just the Billesbergers that were overwhelmed to see Bruno return home. 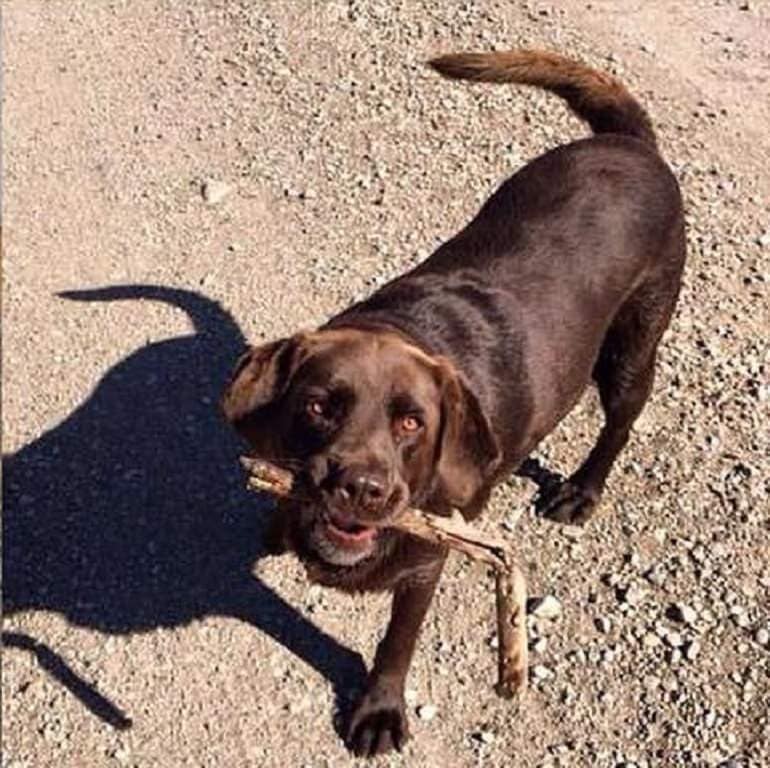 It wasn’t long before the family, and their four-legged friend, were local celebrities in their neighborhood, and it didn’t end there. Cynthia and John were getting plenty of attention from people all around the world. 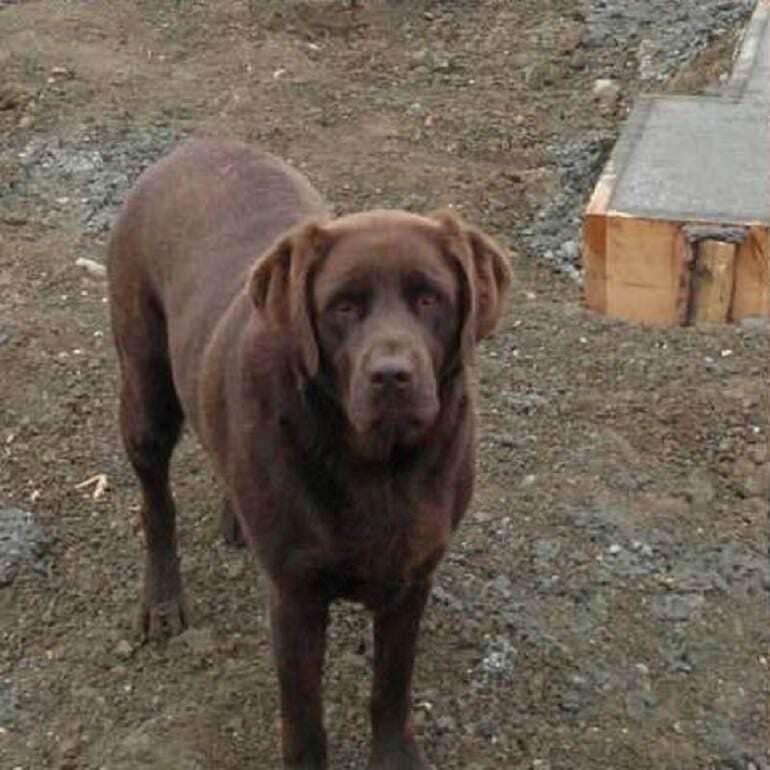 Soon, the pair, and Bruno, were invited onto national talk shows, while newspapers as far spread as the U.K. and Russia were printing stories on their chocolate lab. 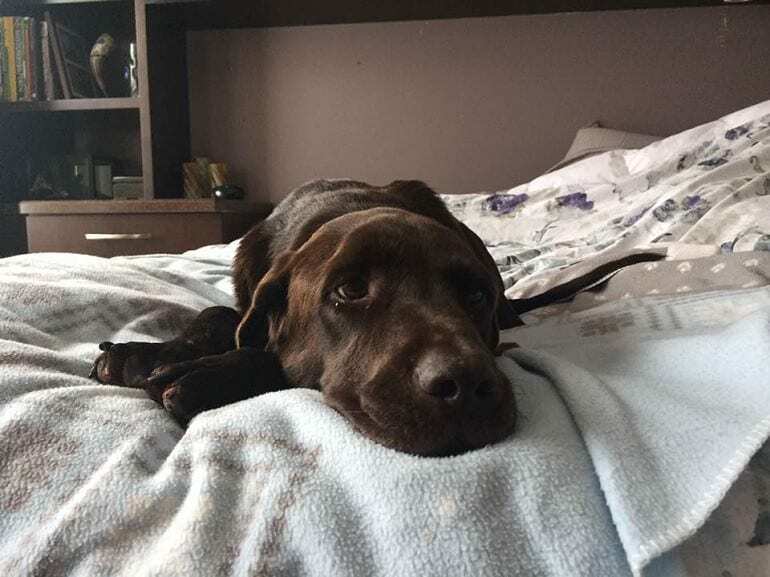 Bruno might have been missing for 27 days, but it wasn’t long before this labrador picked up his rightful place in the family home and settled back into life as a Billesberger. Unfortunately, Bruno now has one less friend by his side as Jasper has since moved on, but Esme is still there to give him all the licks and snuggles he needs. Although the emotional scars of Bruno’s disappearance will always remain, everyone is still so relieved to know he made his way home in the end.